Provisioning Services | The IT Melting Pot! The Citrix Connector 7.5 for System Center 2012 Configuration Manager, also known simply as the Citrix Connector, integrates XenApp and XenDesktop 7 with Configuration Manager 2012 (CM). The Connector streamlines use of Configuration Manager deployment technology to automate Citrix server and desktop image management. The Connector leverages the new Application/Deployment Type (App/DT) feature of Configuration Manager 2012 to orchestrate deployment to the right images at the right time. Administrators can optionally use the App/DT model to deliver the actual application publications. Many of our customers are still early in migrating to the App/DT model. They are still leveraging their extensive library of Packages and Programs developed with great care over many years. These Citrix customers want to know how to use all the goodness of the Connector with these Packages and Programs. So, if you are interested in using the Citrix Connector to deploy Packages and Programs to your Citrix servers and desktop, this post is for you. In many cases deploying Packages and Programs with the Citrix Connector is a straight forward process familiar to any CM administrator. However there are two scenarios in which specific actions are required to avoid unintended consequences when deploying Packages and Programs with the Citrix Connector. The first scenario that requires special consideration is deploying Packages and Programs to VMs created with Citrix XenDesktop Machine Creation Services (MCS) or Citrix Provisioning Services (PVS). As an administrator, you want to deploy software on the master image of a Machine Catalog and rely on XenDesktop/XenApp to clone worker VMs. Deploying directly to VM clones wastes compute, storage, and network resources because each clone will discard the changes on reboot. Thus, the Citrix Connector is optimized to only install applications on the master image of a Machine Catalog while entirely skipping application installation on the clones of the master image. The key enabler that allows us to selectively install applications is a CM client policy that puts a 3rd party agent like the Citrix Connector in charge of when to install application or updates. Here’s the problem. CM client policy does not stop the installation of Packages and Programs or Task Sequences; it only applies to the App/DT model and Windows Updates. This means that the Citrix Connector cannot prevent the installation of Packages and Programs on MCS or PVS clones, leading to unnecessary resource utilization. Create a device collection that contains just the update device and deploy Packages and Programs to this device collection instead of the device collection created by the Citrix Connector. The second scenario comes into play when using the CM Console to publish the Package/Program as a XenApp-hosted application. The Citrix Connector uses CM application detection logic to ensure that the application is installed before publishing it to Citrix Receiver. This is to prevent an icon from appearing in Receiver before all the servers in a Delivery Group have the application installed. Unfortunately Package/Program deployments do not have reliable, ongoing application detection logic. Consequently, this orchestration feature of the Citrix Connector cannot be supported when using the Citrix Application Publishing Wizard to publish apps from the Configuration Manager Console. Use Citrix Studio to publish the application instead of the Citrix Application Publishing Wizard in the CM Console. If you are using CM Application Catalog and want the Citrix hosted version of the installed program to appear there, you will need to create a new application with a Script deployment type and a Citrix deployment type. The Script DT supplies the application detection logic by looking for the application’s executable, while the Citrix DT creates the application publication in XenDesktop. The remainder of this post is divided into two sections and will give specific examples of how to implement the solutions discussed above. The first focuses on image management and precisely targeting the program deployment at the update device for a Citrix device collection. The second section focuses on publishing the program installed by CM as a Citrix hosted app. update the pooled Citrix session hosts with the updated image. For background information about master image management with the Citrix Connector and the role of the update device, watch the Master Image Management video http://www.citrix.com/tv/#videos/11534 on CitrixTV. Before you start, use the machine catalog properties to make sure there is a designated update device, the Update Method property value is “update device”, and the Update Device property value contain a machine name. This is a very important step. If an update device is not defined for a Citrix image managed device collection, the steps outlined below will result in a new device collection with zero members. In the Assets and Compliance section of the Configuration Manager Console, click the “Create device collection” action on toolbar ribbon. There has always been this aura around Machine Creation Services in that it could not hold a candle to Provisioning Services; that you would be completely insane to implement this feature in any but the simplest/smallest deployments. How did we get to this myth? Back in March of 2011 I blogged about deciding between MCS and PVS. I wanted to help people decide between using Provisioning Services and the newly released Machine Creation Services. Back in 2011, MCS an alternative to PVS in that MCS was easy to setup, but had some limitations when compared to PVS. My blog and decision tree were used to help steer people into the PVS route except for the use cases where MCS made sense. Two and a half years passed and over that time, MCS has grown up. Unfortunately, I got very busy and didn’t keep this decision matrix updated. I blame the XenDesktop product group. How dare they improve our products. Don’t they know this causes me more work? It’s time to make some updates based on improvements of XenDesktop 7 (and these improvements aren’t just on the MCS side but also on the PVS side as well). Hosted VDI desktops only: MCS in XenDesktop 7 now supports XenApp hosts. This is really cool, and am very happy about this improvement as so many organizations understand that XA plays a huge part in any successful VDI project. Boot/Logon Storms: PVS, if configured correctly, would cache many of the reads into system memory, helping to reduce the Read IOPS. Hypervisors have improved over the past 2 years to help us with the large number of Read disk operations. This helps lessen the impact of the boot/logon storms when using MCS. 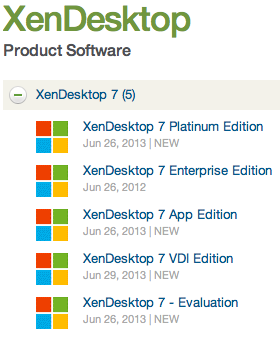 #Citrix #XenDesktop 7 on #vSphere Validated Design Guide is available now! We are pleased to announce the availability of the Citrix Solutions Lab 5000-user XenDesktop 7 on vSphere Validated Design Guide. Yes, you read that right, XenDesktop on vSphere. XenDesktop is also known to many vSphere customers as the best VDI solution for vSphere, and this design guide showcases the latest release of XenDesktop features and functionality all being hosted on a vSphere hypervisor. XenDesktop is the best of both virtual apps and desktops from a single platform, so XenDesktop is VDI, XenDesktop is app virtualization, XenDesktop is server-hosted apps and desktops, XenDesktop is secure remote access, XenDesktop is mobility…and with XenDesktop 7 you get all of this functionality from a single platform. VDI – XenDesktop offers a variety of VDI use cases, whether the user needs a standardized, corporate desktop that remains consistent and routine, or the user needs a personalized virtual desktop that he or she can customize to meet their business needs. This design guide validates XenDesktop Provisioning Services central image management technology for Pooled VDI on vSphere and XenDesktop Personal vDisk technology for delivering Personal VDI on vSphere. Server-hosted Apps and Desktops – XenDesktop also offers server-hosted apps and desktops by leveraging Microsoft Remote Desktop Shared Hosted (RDSH) technology to enable multiple users to connect and share resources from a single server. This design guide showcases XenDesktop server-hosted resources from Windows Servers on vSphere. Remote Access – XenDesktop leverages Citrix NetScaler appliances to provide secure, remote access from any location. NetScaler can be a virtual or physical appliance, and this design guide highlights the implementation and configurations of NetScaler Gateway virtual appliances on vSphere. Ok, it’s here! The official release is now available for everyone! There are tons of blog posts and materials already out there and some great features as well that comes with this new release from Citrix. If you haven’t already played with the Excalibur release and know about them I suggest that you start evaluating and testing now! Excalibur is XenDesktop 7: what does this mean for XenApp and XenDesktop customers? #CitrixSynergy keynote – What will be announced? So here we are! 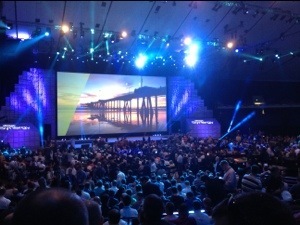 Keynote is about to start! – MDM + MAM + MIM + XA/XD= one solution/service! Have they finally made some progress into integrating Zenprise, AppController and StoreFront into one “App Store” and policy governance model so that we have one (1) app that handles both MDM, MAM and MIM from a device/user perspective? Find below the Citrix Knowledge Center Top 10 for March 2013.